Being able to translate messages, issues and grand challenges in a clear, educational manner is a vital skill for any graphic designer. In an effort to bring those lessons to life, students from Kim Landrum and Kristen Smith’s Advanced Graphics classes participated in a project “Our Plastic, Our Problem,” visually depicting the problem of plastic trash in the world’s waterways. Students first studied the issues leading to plastics in the waterways and were inspired by actual trash that the Office of Sustainability cleaned out of local waterways. Once they decided on an area to focus on, they had their choice of delivering their messages via a poster, infographic, social media campaign, website, gif or three-dimensional art. Almost all the created work focused on the themes of reduce, reuse and recycle. The project was inspired by research by Jenna Jambeck, of the College of Engineering, who recently estimated that eight million metric tons of plastic enter the oceans each year. 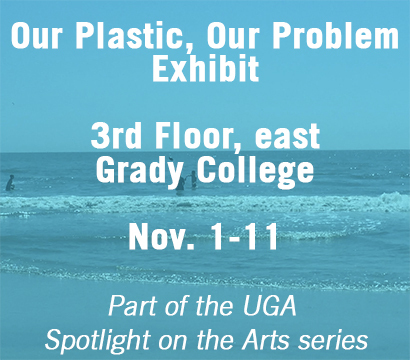 The project is part of the University of Georgia Spotlight on the Arts celebration, Nov. 1-11, 2018.